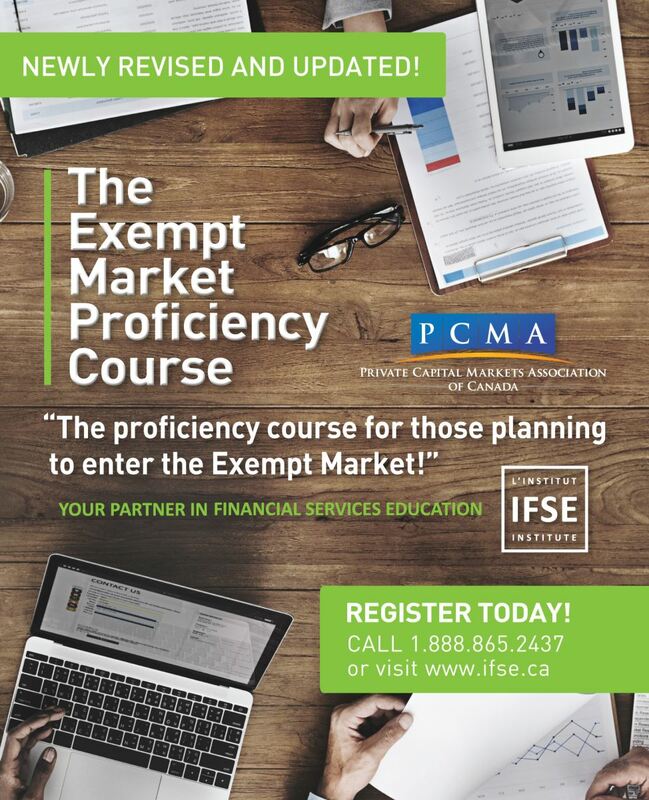 In 2016, IFSE Institute and the Private Capital Markets Association of Canada (PCMA) announced the launch of the new, redesigned Exempt Market Proficiency (EMP) Course (formerly known as the Exempt Market Products Course) provided by the IFSE Institute. The PCMA and IFSE Institute have worked collaboratively to update the content of the EMP Course to reflect the changing industry and educational needs of Dealing Representatives in the exempt market. The PCMA and IFSE considered the feedback of the industry, regulators and past students to assess the strengths of the existing EMP Course and identify areas of improvement and new areas of focus. The Exempt Market Proficiency Course Exam (and its predecessor, the Exempt Market Products Exam) is a proficiency requirement for those individuals seeking registration as Exempt Market Dealers - Dealing Representatives and Chief Compliance Officers. The final exam is administered and delivered exclusively by IFSE's testing partner, Pearson VUE. Students will be given login credentials to schedule their exam directly on the Pearson VUE website. Pearson VUE and its affiliates have over 150 testing centres across Canada to service the needs of IFSE students.